Sessions: April 10: 10:00 am - 11:30 a.m. - 15:30 p.m.
April 11 and 12: 10:00 a.m. - 11:30 a.m.
(*) Once finished the show, will access to the Concert Hall and children will be able to see the architectural details that have been projected in the concert. From the musical universe of architecture and one of the great intellectuals of Catalan Modernism, we will review the history of music through recreating various mapping projections emblematic spacespresent in the life of Lluís Domènech i Montaner. Lluís Domènech i Montaner was a big music buff and one of the most universal Catalan architects. As a political historian and humanist committed to his country, to rediscover some of the most important churches of Catalan Romanesque art, like the church of Sant Climent of Taüll in the Boi Valley. 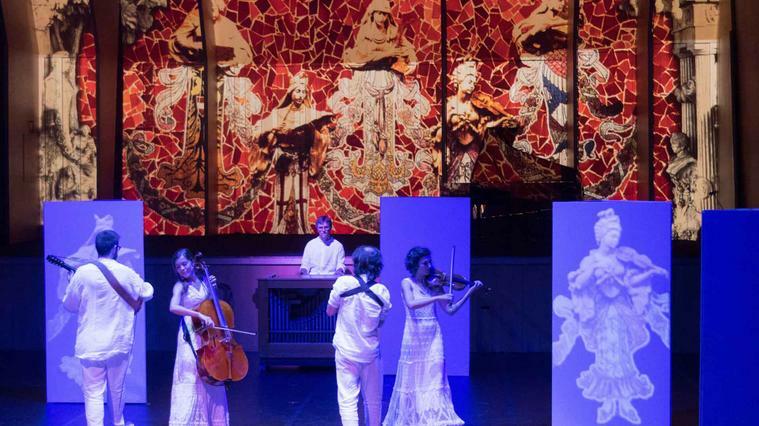 Make a journey through the history of Western music starting with emblematic works that have been heard at the Palau de la Música Catalana during its 110 years.. Recognize and explore architectural spaces emblematic of Catalonia. Listen to music from different eras, authors and styles. Discover unusual instruments: organ, harpsichord, wheel viola, etc.